This West End district, located between Bloomsbury, Marylebone and Soho, probably owes its name to the Fitzroy Tavern, a public house which in turn is believed to owe its name to the Dukes of Grafton, whose family name was Fitzroy. The Fitzroys (the name derives from a Norman-French phrase and was typically associated with base-born royal sons), owned land in the area until the end of the 1800s. The family first become associated with the area after the Manor of Tottenham (more on that name in an upcoming post) came into the possession of Henry Fitzroy, an illegitimate son of King Charles II who became the Earl of Euston and later Duke of Grafton. Incidentally, the grand Fitzroy Square, developed by the duke’s grandson, and Fitzroy Street are both also named after the family as are numerous other locations in the area including Grafton Street. Fashionable as a residential area in the 1700s, the houses were gradually transformed into workshops – the area was noted for furniture-makers in particular – or cheap tenements and it’s during this period in the early 1800s that artists like John Constable were living in the area. The name Fitzrovia apparently became popularised for the district which in the inter-war years, due to the community of artists and writers that met at the pub; it is said to have first appeared in print in the 1940s. Among those who were associated with the area during this period were the likes of writers Dylan Thomas and George Orwell and artists like Roger Fry and Augustus John. More recently the area has become home to numerous media companies, particularly TV-related companies, and still hosts ample pubs, restaurants and cafes. 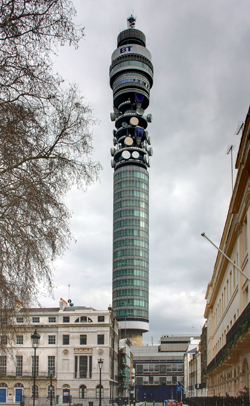 Notable buildings in the area include the BT Tower, a communications tower completed in 1964 which was until 1980, the tallest building not only in London but in the UK (and from where panoramic views could once be had – sadly it’s been long closed to the public). Fitzrovia is also home to the quirky Pollock’s Toy Museum. It was certainly those “trendy literati” who popularised the name but I didn’t find any reference to the name being a conjunction of Fitzroy and Bohemia. The name certainly came from the tavern but as to how they came up with the form ‘Fitzrovia’ – be interesting to know!